Habit: Plant 10--30 cm, +- glabrous. Leaf: alternate, linear. Inflorescence: +- raceme-like, widely spreading; pedicels 6--25 mm, generally pendent or +- reflexed. Flower: sepals 1.5--3.5 mm, glabrous except margins minutely gland-toothed; petals 4--7 mm, white or pale pink, generally darker-veined; stamens 4--9 mm, anthers pink to red-purple, margined white; ovary chambers 6, styles 3, 3.5--7 mm, +- white. Chromosomes: n=18. 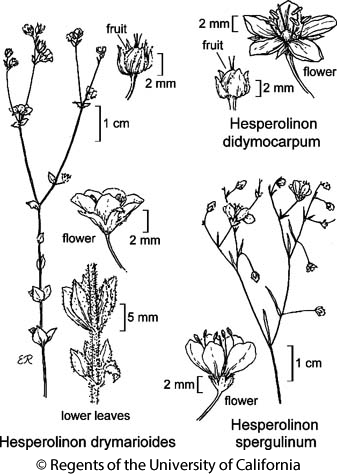 Citation for this treatment: Joshua R. McDill 2012, Hesperolinon spergulinum, in Jepson Flora Project (eds.) Jepson eFlora, http://ucjeps.berkeley.edu/eflora/eflora_display.php?tid=28046, accessed on April 20, 2019. No expert verified images found for Hesperolinon spergulinum. c&s NCoR, w SnFrB. Markers link to CCH specimen records. Yellow markers indicate records that may provide evidence for eFlora range revision or may have georeferencing or identification issues. Purple markers indicate specimens collected from a garden, greenhouse, or other non-wild location.